I was trying to find something big but not TOO big to write about this week, and then it dawned on me - I could write about "The Losers" by Andy Diggle and Jock, which most of you have probably never heard about. 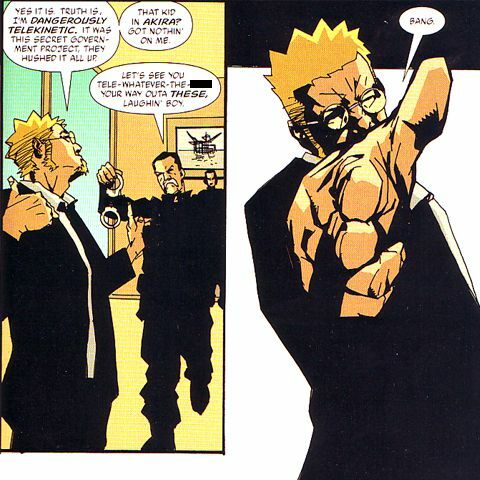 "The Losers" ran for 32 issues at Vertigo, its intended length. (For some strange reason, people often think the book got cancelled, even though the story ends exactly where it needs to...) It's collected in 5 slim trade paperbacks or 2 larger trade paperbacks, to tie in with the release of the movie, that wasn't terrible, but wasn't amazing either, despite a marvelous cast, but more on that in a bit. It's a classic sort of revenge tale, with a group of spec ops troops getting revenge on their CIA handler who fucked them, but it's also got a lot of other big political elements that were relevant at the time, and a lot of which are still relevant now, including "the war on terror," race relations in the US, the CIA's involvement in global politics and a bunch of other stuff. This is the book that put Andy Diggle on the scene for me as a writer, and I've mostly followed his writing career since this, although he's certainly one of the more up-and-down writers I tend to follow. Some of his projects have absolutely been amazing (such as his run on Hellblazer or his Green Arrow: Year One, a lot of which provided the foundation for the "Arrow" TV show) and some of them, well, some of them have not (*coughcough* AdamStrange *coughcough*). Mostly, though, Diggle's known for writing great dialogue and keeping stories spinning. Jock's art, however, is certainly an acquired taste. I very much enjoy Jock's angular, almost chunky, style, because it usually fits for the type of material he's working on. It's noir-ish, and Jock has a very excellent grasp of how to darken in a scene, how to use lighting and how to give striking perspectives, but some people think his artwork is a little too raw for their liking, and I can understand that. Like I said, he's not an artist for everyone, but I dig him. That's Jensen with the glasses..
"The Losers" is a fun tale in the tradition of "The Dirty Dozen," and the team of agents is all sorts of crazy. The plot takes a number of twists (and the last arc is maaaaaybe a bit bigger than some people can handle, a little too world super-villain and not enough grounded reality) and you're always going to be guessing where it's going to go next. The story is a complete package, though, so you'll have a nice resolved ending and feel like you've been on a big journey over the course of it. You can get the whole thing in "Book One" and "Book Two" on Amazon for your Kindle for $25, or in paper for $35 or so. Here's the trailer, to whet your whistle. Go buy the two books, even if the last act can get a bit operatic. You'll love them. I know I did.